Detroit's Avenue of Fashion was once the top destination for luxury shopping, with a musical legacy shaped by American jazz. Over the years, the energy of this once vivacious district came to a lull, but today, this arts and cultural district is on the verge of a renaissance. In the summer of 2013, WCIP collaborated with Revolve Detroit on an ArtPlace America Placemaking grant. Our goal was to transform a street into a destination. In order to grow the story of this vibrant community, we proposed activating the vacant shops with engaging public art, memorable environments, and rich participatory programming. We selected artists, local and international, to work with entrepreneurs to build out each of their spaces, while developing a rich program of events for our debut night during the Detroit Design Festival. 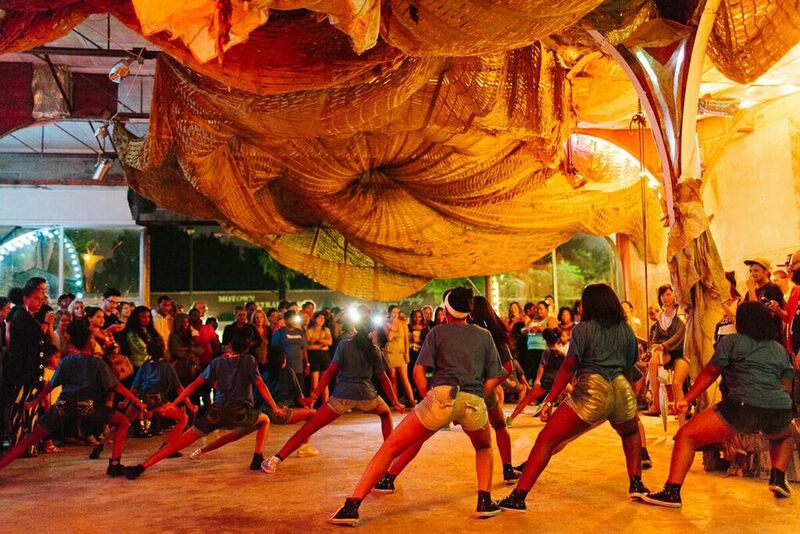 Exactly four months after the ArtPlace America grant announcement, we unveiled a dramatic street transformation and the launch of 31 new art and entrepreneurial projects to an audience of over 3,000 people. The impacts of the project extended far beyond the storefronts. Existing businesses were inspired by the new look and increase in attention. Coalitions formed, competing businesses joined together, and new models of collaboration and engagement were developed. Today, all of the businesses we moved in through the project are still operating - and the neighborhood is growing! View the before and after shots on Curbed. The first step was to create a community storefront where the project could be conceived and created collaboratively with our neighbors. Michael Owen, a muralist from Baltimore, completed a massive mural project. The community weighed in on who they wanted to see on the wall, the final piece showcasing famous musicians like Marvin Gaye and Stevie Wonder who called this neighborhood home. French photographer Thomas Humery shot a book of portraits of scenarios throughout the neighborhood entitled, Layers. Artist Carrie Walker created Ghost Jungle, a dream-like paper installation addressing the way nature will reclaim a building when given enough time, water, and light - by beginning with merely a seed. The new Regal Cafe featured a pop-up bookstore and also partnered with the gallery next door to showcase artwork and host events. Designers Joshua Smith and Jessica Janda developed a comprehensive signage package for the block, offering each business an opportunity to develop and elevate their graphic identity. Yvette Jenkins began in Love Travels Imports, a shop that connects Fair Trade, handcrafted work of artisans with people around the world. Artist Tiff Massey built a minimalistic gallery space to spotlight her textural creations. The new bakery on the block, Good Cakes and Bakes, featured a delicious mural by artists Monica Canilao and Louise Chen. Art in Motion built a ceramics studio that offers classes, private studios, and a gallery to showcase students' works. Artist Cristin Richard reconstructs animal intestines into tangible objects. For her Avenue of Fashion-inspired installation, Cristin constructed garments and tinted them to match the exact skin tone of models with different ethnicities, composing a juxtaposition of modern culture within a historical context. Defunct parking meters were transformed into a permanent installation by Pam Tietze of H0les - allowing the viewer to see the street through a collection of kaleidoscopic viewfinders. A very raw storefront was transformed into Dacha, a temporary performance space by Harrison Richards Bartlett III, Delaney Martin, Taylor Lee Shepherd, Margot Couture, Arielle De Pinto and Artem Voevodin. A spectacular program was developed in collaboration with several talented performers from neighboring businesses.